The National Bank of Poland (NBP) has made a substantial purchase of gold, increasing its reserves by approximately 9 metric tonnes this summer. The purchase marks the eastern European state’s biggest for two decades and is one of the largest ever by any EU member state. 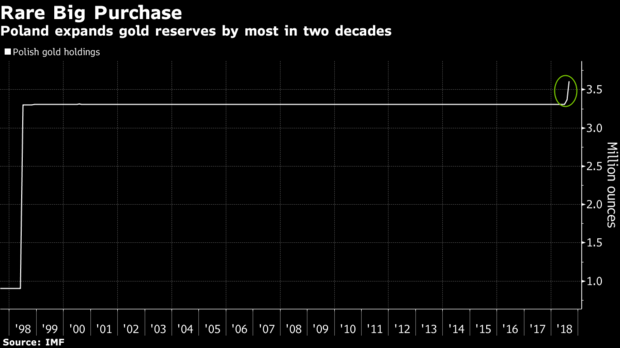 Prior to this purchase the World Gold Council listed Poland’s reserves as being 103 tonnes, most of which are alleged to be held in London by the Bank of England. Buying gold at this time is seen as prudent as the price remains low. Summer often sees low gold prices, which this year have continued into October. This morning gold was priced at $1,193, giving Poland’s new gold an approximate market value of $345.2 million. Poland’s gold purchase takes its holdings up to their highest level since 1983 and mirrors recent gold purchases by Russia and India. Central bank holdings globally are now thought to be at their highest in two decades. China is also alleged to have significantly increased its gold reserves while Hungary and Germany have both repatriated large amounts of their gold. This week the euro weakened as Italy’s populist government pushed ahead with its controversial budget, funded by widening its spending deficit. Such a prominent gold buy was also seen as good for markets: “A broader and more representative base of central bank buyers can only be good news,” Matthew Turner, a strategist at Macquarie Group Ltd told the newswire.